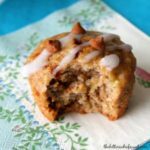 Cinnamon Banana Bread Muffins are a moist, melt in your mouth muffin with lots of cinnamon and banana flavor! Hey Juggling Act Mama readers! I haven’t seen you since Febuary when we were smoothered in all things red and I brought you this recipe. Well this time I am bring you a banana bread recipe that would be perfect for brunch or Mother’s day! In fact, I think I will remake these or show my kids how to make them just so I can have them for Mother’s Day! A few weekends ago I decided I was going to make my banana bread recipe. It had been awhile and I went on a banana buying rampage. So I made two loafs and then thought of you guys! 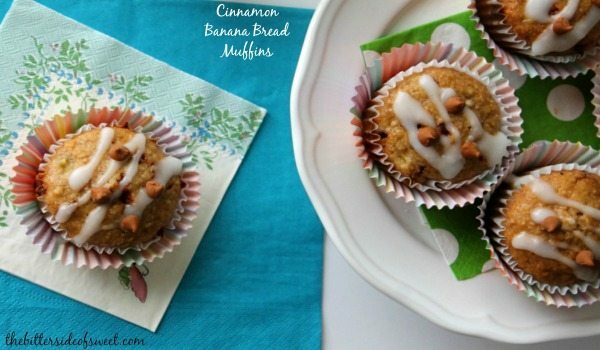 I knew you might enjoy these and adding the cinnamon chips to these was pretty genius if I do say so myself! They take a normal banana bread and accelerate it to a whole new level! So if you are looking for something easy, new and fabulous for your mom or just a lazy weekend breakfast, I highly recommend making these! ENJOY! Preheat oven to 350 and 2 12 cup muffin pans by lining with cupcake liners. In one large bowl mix flour, baking soda, salt and cinnamon and set aside. In another large bowl mix together banana, sugar, brown sugar, sour cream, oil, eggs and vanilla. Add wet mixture to the flour mixture and stir well till all is incorporated. Place 1/4 cup batter into cupcake liners. Cool for 5 minutes before removing from pan. ENJOY! To make glaze: combine 4 tablespoons powdered sugar and 1 tablespoon milk. Allow to thicken up for about 10 minutes, then drizzle onto cooled muffins! Oooo…Cinnamon Chips! 🙂 One of the most amazing inventions of all time!! 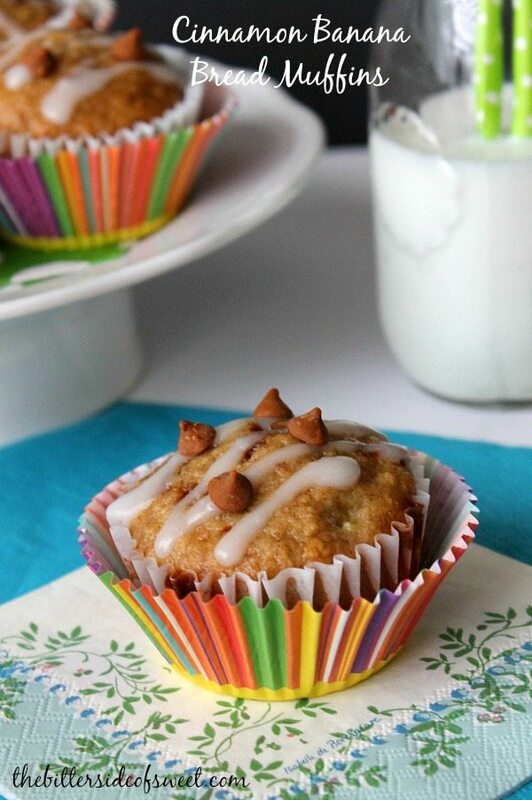 I bet these muffins taste like heaven! 🙂 Pinned!